37 CFR 3.71 (pre-AIA) Prosecution by assignee. (a) Patents — conducting of prosecution. 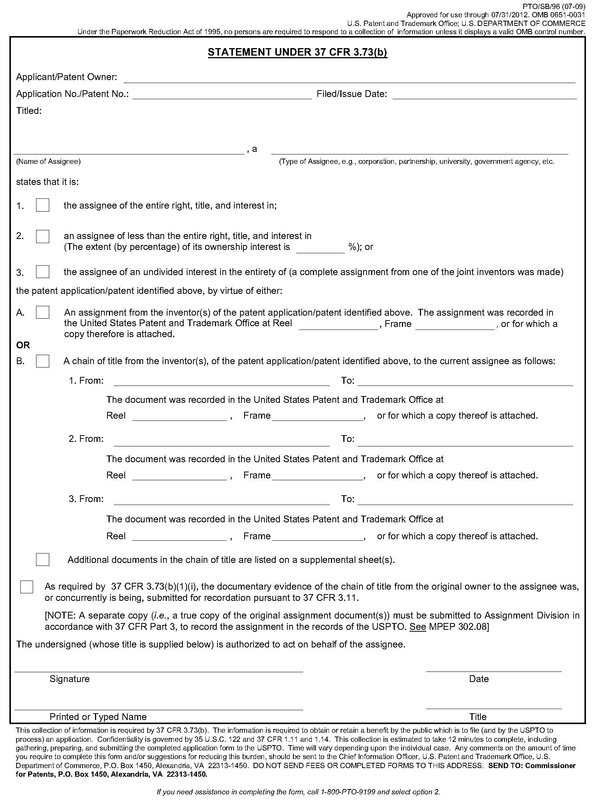 One or more assignees as defined in paragraph (b) of this section may, after becoming of record pursuant to paragraph (c) of this section, conduct prosecution of a national patent application or a reexamination proceeding to the exclusion of either the inventive entity, or the assignee(s) previously entitled to conduct prosecution. (2) Partial assignee(s) together or with inventor(s). All partial assignees, or all partial assignees and inventors who have not assigned their right, title and interest in the application or patent being reexamined, who together own the entire right, title and interest in the application or patent being reexamined. A partial assignee is any assignee of record having less than the entire right, title and interest in the application or patent being reexamined. 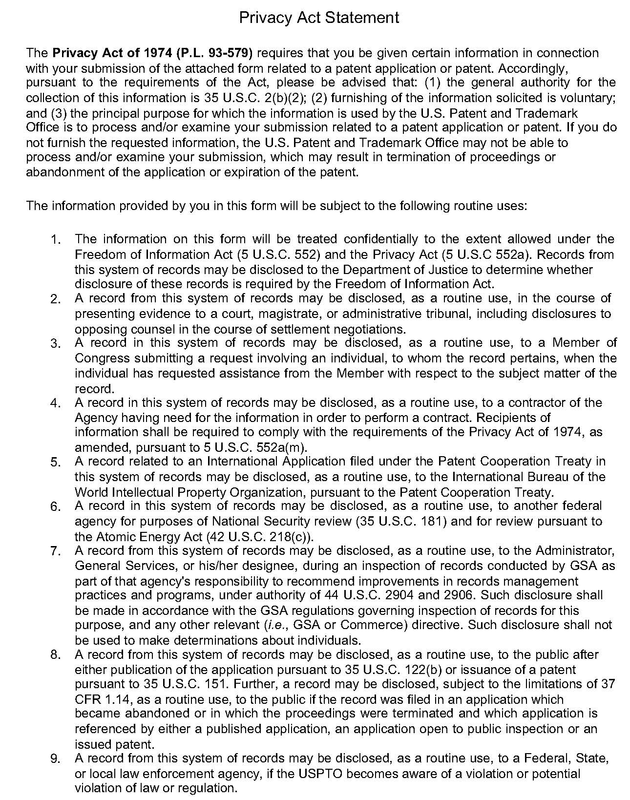 (c) Patents — Becoming of record. An assignee becomes of record either in a national patent application or a reexamination proceeding by filing a statement in compliance with § 3.73(b) that is signed by a party who is authorized to act on behalf of the assignee. (d) Trademarks. The assignee of a trademark application or registration may prosecute a trademark application, submit documents to maintain a trademark registration, or file papers against a third party in reliance on the assignee’s trademark application or registration, to the exclusion of the original applicant or previous assignee. The assignee must establish ownership in compliance with § 3.73(b). 37 CFR 3.73 (pre-AIA) Establishing right of assignee to take action. (a) The inventor is presumed to be the owner of a patent application, and any patent that may issue therefrom, unless there is an assignment. The original applicant is presumed to be the owner of a trademark application or registration, unless there is an assignment. (ii) A statement specifying where documentary evidence of a chain of title from the original owner to the assignee is recorded in the assignment records of the Office (e.g., reel and frame number). (ii) Being signed by a person having apparent authority to sign on behalf of the assignee, e.g., an officer of the assignee. (1) Establishment of ownership by the assignee must be submitted prior to, or at the same time as, the paper requesting or taking action is submitted. (2) If the submission under this section is by an assignee of less than the entire right, title and interest, such assignee must indicate the extent (by percentage) of its ownership interest, or the Office may refuse to accept the submission as an establishment of ownership. The owner or assignee (other than a juristic entity) of a patent property based on an application filed before September 16, 2012, can take action in a patent application or patent proceeding in numerous instances. The owner or assignee can sign a reply to an Office action (pre-AIA 37 CFR 1.33(b)(3) and (4)), a request for a continued prosecution application under 37 CFR 1.53(d) (MPEP § 201.06(d)), a terminal disclaimer (MPEP § 1490), Fee(s) Transmittal (PTOL-85B) (MPEP § 1306), or a request for status of an application (MPEP § 102). The owner or assignee can file an application under pre-AIA 37 CFR 1.47(b) (MPEP § 409.03(b)), appoint its own registered patent practitioner to prosecute an application (pre-AIA 37 CFR 1.32 and MPEP § 402.07), and grant a power to inspect an application (MPEP § 104). The owner or assignee consents to the filing of a reissue application (MPEP § 1410.01), and to the correction of inventorship (MPEP § 602.01(c) or MPEP § 1481). Effective September 16, 2012, an owner or assignee who is a juristic entity must be represented by a patent practitioner. See 37 CFR 1.31. Juristic entities may sign small entity assertions under 37 CFR 1.27 (MPEP § 509.03), disclaimers under 37 CFR 1.321 (MPEP § 1490), submissions under 37 CFR 3.73 to establish ownership, powers of attorney under 37 CFR 1.32 (MPEP § 402) and powers to inspect under 37 CFR 1.14 (MPEP § 104). However, any other paper submitted on behalf of a juristic entity on or after September 16, 2012, must be signed by a patent practitioner. See subsection VI below for a discussion of when ownership must be established to take action in a patent matter, and subsection VII below for a discussion of when ownership need not be established to sign certain papers. (C) some combination of the assignee(s), and inventor(s) who have not assigned away their right, title and interest in the application. Pursuant to pre-AIA 37 CFR 3.73(b), a party must be established as the assignee by satisfying the requirements of that subsection, in order to be recognized as an owner or part owner, for purposes of taking action in patent matters before the Office. As discussed in subsection II below, all parties having any portion of the ownership must join in “taking action” (i.e., act together as a composite entity) in order to be entitled to conduct the prosecution in patent matters. If there is a single assignee of the entire right, title and interest in the patent application, pre-AIA 37 CFR 3.71(b)(1) provides that the single assignee (i.e., individual assignee) may act alone to conduct the prosecution of an application or other patent proceeding (upon complying with pre-AIA 37 CFR 3.73(b)). (A) The application has not been assigned, and ownership resides solely in the inventor(s) (i.e., the applicant(s)). In this situation, pre-AIA 37 CFR 3.71 does not apply, since there is no assignee, and the combination of all inventors is needed to conduct the prosecution of an application. (B) The application has been assigned by at least one of the inventors, and there is thus at least one “partial assignee.” As defined in pre-AIA 37 CFR 3.71(b)(2), a partial assignee is any assignee of record who has less than the entire right, title and interest in the application. The application is owned by the combination of all partial assignees and all inventors who have not assigned away their right, title and interest in the application. Where at least one inventor retains an ownership interest together with the partial assignee(s), the combination of all partial assignees and inventors retaining ownership interest is needed to conduct the prosecution of an application, unless one or more inventors have refused to join in the filing of the application and a petition under pre-AIA 37 CFR 1.47 has been granted. If a petition under pre-AIA 37 CFR 1.47 has been granted, then the assignee need only be the assignee of the entire interest of the pre-AIA 37 CFR 1.47 applicant to sign a power of attorney. See pre-AIA 37 CFR 1.32(b)(4). Where an applicant retains an ownership interest, the combination of all partial assignees and the applicant with the ownership interest is needed to conduct the prosecution of an application. Where a reissue application is filed to correct inventorship in the patent by the deletion of the name of inventor X and inventor X has not assigned his/her rights to the patent, inventor X has an ownership interest in the patent. Inventor X must consent to the filing of the reissue application, even though inventor X is being deleted and need not sign the reissue oath or declaration. If inventor X has assigned his/her rights to the patent, then inventor X’s assignee must consent to the filing of the reissue application. Inventors A and B invent a process and file their application, signing the declaration for the patent application. Inventors A and B together may conduct prosecution of the application. Inventor A then assigns all his/her rights in the application to Corporation X. As soon as Corporation X (now a partial assignee as per pre-AIA 37 CFR 3.71(b)(2)) is made of record in the application as a partial assignee (by filing a statement pursuant to pre-AIA 37 CFR 3.73(b) stating Corporation X is an assignee of an undivided interest in the entirety of the application), Corporation X and Inventor B together may conduct prosecution of the application. Corporation X and Inventor B then both assign their rights in the application to Corporation Y. As soon as Corporation Y (now an assignee of the entire right, title and interest) is made of record in the application as the assignee (by filing a statement pursuant to pre-AIA 37 CFR 3.73(b) stating it is assignee of the entire right, title and interest), Corporation Y is then the sole (one hundred percent) owner and thus may, by itself, conduct prosecution of the application. (B) a statement specifying, by reel and frame number, where such evidence is recorded in the Office. Documents submitted to establish ownership are required to be recorded, or submitted for recordation pursuant to 37 CFR 3.11, as a condition to permitting the assignee to take action in a matter pending before the Office. The action taken by the assignee, and the pre-AIA 37 CFR 3.73(b) submission establishing that the assignee is the appropriate assignee to take such action, can be combined in one paper. The establishment of ownership by the assignee must be submitted prior to, or at the same time as, the paper requesting or taking action is submitted. Pre-AIA 37 CFR 3.73(c). If the submission establishing ownership is not present, the action sought to be taken will not be given effect. If the submission establishing ownership is submitted at a later date, that date will be the date of the request for action or the date of the assignee’s action taken. The submission establishing ownership by the assignee must be signed by a party who is authorized to act on behalf of the assignee. See discussion below. Once pre-AIA 37 CFR 3.73(b) is complied with by an assignee, that assignee may continue to take action in that application, patent, or reexamination proceeding without filing a pre-AIA 37 CFR 3.73(b) submission each time, provided that ownership has not changed. The submission establishing ownership by the assignee pursuant to pre-AIA 37 CFR 3.73(b) is generally referred to as the “statement under 37 CFR 3.73(b)” or the “37 CFR 3.73(b) statement.” A duplicate copy of the pre-AIA 37 CFR 3.73(b) statement is not required and should not be submitted. See 37 CFR 1.4(b) and MPEP § 502.04. (B) contain a newly executed statement under pre-AIA 37 CFR 3.73(b). When a continuation-in-part application is filed before September 16, 2012 by an assignee, a newly executed statement under pre-AIA 37 CFR 3.73(b) must be filed. When in a design application, a continued prosecution application (CPA) under 37 CFR 1.53(d) is filed, the statement filed under 37 CFR 3.73(b) in the parent application will serve as the statement for the CPA. Where a Request for Continued Examination of an application is filed under 37 CFR 1.114, the application is not considered to be abandoned; rather the finality of the Office action is withdrawn and the prosecution continues. Thus, the statement under pre-AIA 37 CFR 3.73(b) in the application will continue to serve as the statement establishing ownership. (A) The submission may be signed by a person in the organization having apparent authority to sign on behalf of the organization. Pre-AIA 37 CFR 3.73(b)(2)(ii). An officer (chief executive officer, president, vice-president, secretary, or treasurer) is presumed to have authority to sign on behalf of the organization. The signature of the chairman of the board of directors is acceptable, but not the signature of an individual director. Modifications of these basic titles are acceptable, such as vice-president for sales, executive vice-president, assistant treasurer, vice-chairman of the board of directors. In foreign countries, a person who holds the title “Manager” or “Director” is normally an officer and is presumed to have the authority to sign on behalf of the organization. A person having a title (administrator, general counsel) that does not clearly set forth that person as an officer of the assignee is not presumed to have authority to sign the submission on behalf of the assignee. A power of attorney (pre-AIA 37 CFR 1.32(b)(4)) to a patent practitioner to prosecute a patent application executed by the applicant or the assignee of the entire interest does not make that practitioner an official of an assignee or empower the practitioner to sign the submission on behalf of the assignee. (B) The submission may be signed by any person, if the submission sets forth that the person signing is authorized (or empowered) to act on behalf of the assignee, i.e., to sign the submission on behalf of the assignee. Pre-AIA 37 CFR 3.73(b)(2)(i). (C) The submission may be signed by a person empowered by an organizational resolution (e.g., corporate resolution, partnership resolution) to sign the submission on behalf of the assignee, if a copy of the resolution is, or was previously, submitted in the record. Where a submission does not comply with (A), (B), or (C) above, evidence of the person’s authority to sign will be required. Examples of situations where ownership must be established under pre-AIA 37 CFR 3.73(b) are when the assignee: signs a request for status of an application or gives a power to inspect an application (MPEP §§ 102 and 104); appoints its own registered attorney or agent to prosecute an application (pre-AIA 37 CFR 3.71 and MPEP § 402.07); signs a disclaimer under 37 CFR 1.321 (MPEP § 1490); consents to the filing of a reissue application (MPEP § 1410.01); consents to the correction of inventorship in a patent (MPEP § 1481); or signs a Fee(s) Transmittal (PTOL-85B) (MPEP § 1306). Effective September 16, 2012, a juristic entity (e.g., organizational assignee) must be represented by a patent practitioner. See 37 CFR 1.31. Examples of situations where ownership need not be established under pre-AIA 37 CFR 3.73(b) are when the assignee: signs a small entity statement (MPEP § 509.03); signs a statement of common ownership of two inventions (MPEP § 706.02(l)(2)); signs a NASA or DOE property rights statement (MPEP § 151); signs an affidavit under 37 CFR 1.131(a) where the inventor is unavailable (MPEP § 715.04); signs a certificate under 37 CFR 1.8 (MPEP § 512); or files a request for reexamination of a patent under 37 CFR 1.510 (MPEP § 2210). When an assignee seeks to take action in a matter before the Office with respect to a patent application, patent, or reexamination proceeding and the right, title, and interest therein is held by more than one assignee, each partial assignee must provide a submission under pre-AIA 37 CFR 3.73(b). In each submission, the extent of each assignee’s interest must be set forth so that the Office can determine whether it has obtained action by the entirety of the right, title and interest holders (owners). Pre-AIA 37 CFR 3.73(c)(2). If the extent of the partial assignee’s ownership interest is not set forth in the submission under pre-AIA 37 CFR 3.73(b), the Office may refuse to accept the submission as an establishment of ownership interest. Where there are two or more conflicting pre-AIA 37 CFR 3.73(b) statements in an application or other Office proceeding, the statement with the latest date of submission to the Office will normally control as to establishment of the assignee. If, however, the ownership established as controlling is contested on the record by another party who has submitted a conflicting pre-AIA 37 CFR 3.73(b) statement, then the application or other proceeding shall be forwarded by the Office official in charge of the application or other proceeding to the Office of Patent Legal Administration for resolving any procedural issues. Generally, where there are two or more conflicting pre-AIA 37 CFR 3.73(b) statements in an application, the ownership entity that filed that application will be permitted to conduct the prosecution, and the other party that submitted a pre-AIA 37 CFR 3.73(b) statement to establish its ownership may wish to consider filing its own application. Form PTO/SB/96 may be used to establish ownership under pre-AIA 37 CFR 3.73(b).